A view of the city. Pretty blushing tones. A relaxing retreat above it all. This is the home that interior designer Taylor Spellman created in New York's Upper East Side. Spellman is known for her hit Bravo series, Yours, Mine or Ours. But before Bravo fame, this New York interior designer had made it as one of New York City's top stagers. ​With a unique talent of mixing high end one-of-a-kind pieces with treasures found on at vintage shops, Spellman's signature style blends bold design with soft details. This can be found in her latest project located in New York's Upper East Side neighborhood. Spellman brought her interior design expertise to this unique, oversized loft inside 389 E 89, a luxury uptown condominium. In this interior, the designer handpicked pieces that accentuate and compliment what is a spacious 1,079-square-foot residence. An open plan loft which features a pastel and gray color palette and soaring ceilings over ten feet high, with oversized windows that bathe the home in natural light and that provide residents with striking views of idyllic, tree-lined streets. All of this and more inspired Spellman's design of this New York residence in one of the city's most sought-after neighborhoods. The bedroom in this open-plan environment is quaint and lovely. The bed is situated off to the right of the bedroom. Next to oversized windows, the bedroom is flooded with natural light, making it a relaxing area of the home to retreat in. Taylor chose a subtle color palette for the space. The palette has been used not only in the bedroom, but in a way that ties the entire interior together. 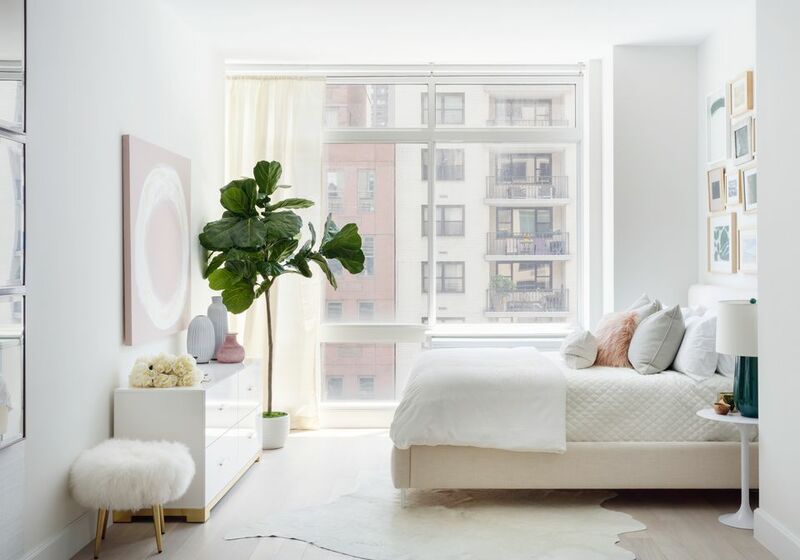 A color palette of soft blush and off-white tones dominates the bedroom. The bed features an off-white fabric upholstered frame for ultimate comfort. Throws in a similar shade harmonize in the space. On the bed, soft gray and pink pillows add a color splash to a mostly neutral space. Vibrant décor such as a large pastel pink canvas above the dresser and a collection of framed photos adorn the walls surrounding the bed creating an elegant and serene aesthetic. For the bedroom and living area to seamlessly connect, Taylor chose a plush sand colored sectional couch for the living area. In this cozy interior, it's large enough to fit a number of guests when entertaining. To add some color to the living room, blushing pink velvet and white accent pillows line the sofa to create a softly-hued vignette. The colors in the living area are a direct reflection of the blushing pillows in the bedroom as well. To add a metallic touch to the space, a set of glass side tables with oblong gold detailing adds a luxurious touch. And a gold credenza placed against the living room wall becomes the perfect media area for sitting back and watching TV. Spellman has designed a living space that is cheerful, inviting, with ambiance ideal for entertaining and relaxation. Even in a small space such as this one, Spellman has found way to bring in elements that add to the interior's design. Art has been used as a replacement for architectural detail, creating interest in every part of this Upper East Side home. The interior sports not one, two, but three gallery walls in the space. In the living area, a gallery wall has been used to create a division and delineate space between the living area and the bedroom. On the living room wall, above the sectional, a grid of art in maroon matted frames adds another colorful touch in the interior. Beyond the art for even more pretty details, at the entryway a gold mirror sits above a bone inlay console for a detailed touch. The condo's bathroom provides a cozy space for the homeowner. Tile, which continues to be on trend, makes a statement in the space, with a grid of off-white tile and marble details adding texture in the bathroom. Chrome fittings add luxury and ensure that relaxing showers are a given in the space. A marble sink is the final glamorous detail in a small home where big style reigns.